The National Association for Business Resources (NABR) announced Riverway Business Services as a 2019 Winner for Houston's Best & Brightest Companies to work for Program! Employees evaluated Riverway in areas such as communication, work-life balance, employee education, diversity, recognition, retention and more. Riverway strives to incorporate its 5 Core Values of Respect, Innovation, Growth, Honesty and Teamwork into its everyday practices, which results directly affect the areas of human resource practices that employees look for in an employer. The Best and Brightest Companies to Work For® awards ceremony plans to host over 300 attendees. 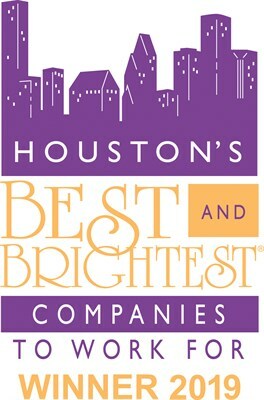 Houston's Best and Brightest Companies to Work For® is a yearlong education and celebration program. The program includes Resources, Elite Suite Workshops, Assessment Tools, and the Celebratory Symposium and Luncheon. The Awards competition provides the business community with the opportunity to gain recognition, showcase their best practices and demonstrate why each of them would be an idea place for employees to work. We are thrilled to accept our award at the celebratory Symposium later this month at the Marriott Houston West Loop Galleria.